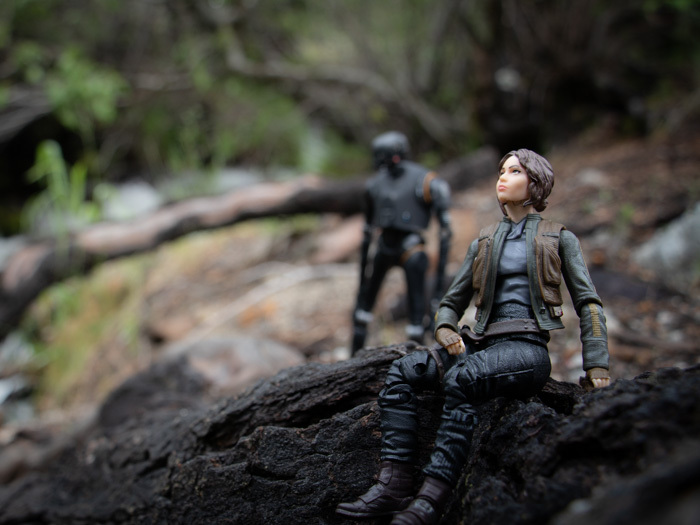 As we often share stories from toy photographers about their “Why” (see JoanMarcF’s post or Carlos Hernández’s for a couple of recent ones), it got me thinking about how we find our place as a toy photographer, and specifically finding a niche within the fictional universes we love. It can happen organically over time, or sometimes we may search intentionally for a place where we belong, or where we feel we can contribute something special. 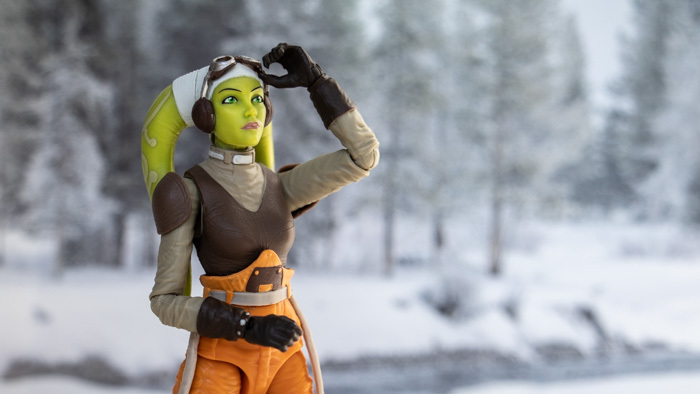 Today I share my story of searching for a place in the Star Wars toy photography universe here as a conversation starter, hoping it will spark an idea for you as well. Stormtroopers are an obvious place to start. The Star Wars toy photo landscape is somewhat dominated by stormtroopers, and action shots of these figures are common and varied. 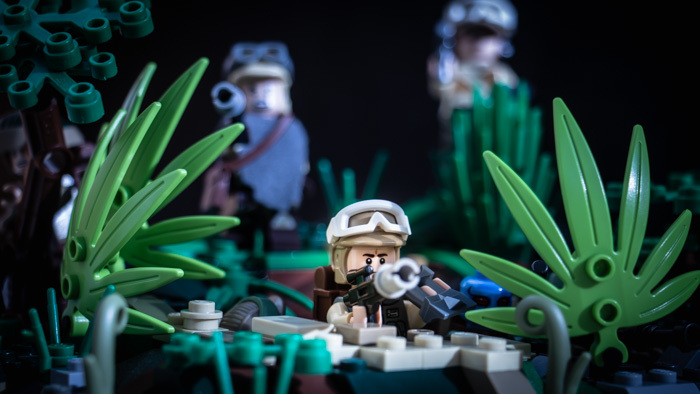 Explosions, firefights, marching through various terrain, dealing with the hardships of deployment and war… the troopers are a versatile subject with a lot of stories to tell. I am not strongly drawn to the trooper scene, myself, as my personal Star Wars foundation was based on the original trilogy. Stormtroopers were little more than the muscle of the Empire, and I saw them simply as “the bad guys”. You won’t find my photos in the trooper shots. (At least not at the moment.) I would probably take more trooper shots if it weren’t for two things: first, I feel unqualified to take realistic shots, because I don’t know which troopers go with which other characters. So many times my son has said things like, “No, Mom, that’s the First Order trooper, he goes with Finn and old Han, not Lando and young Han.” I feel like I should memorize who goes with what so I don’t violate some unspoken trooper rules. I’m sure this is a silly reason, and there are probably tons of photographs that don’t put the “right” troopers together, but it still makes me hesitant to jump into the trooper scene. 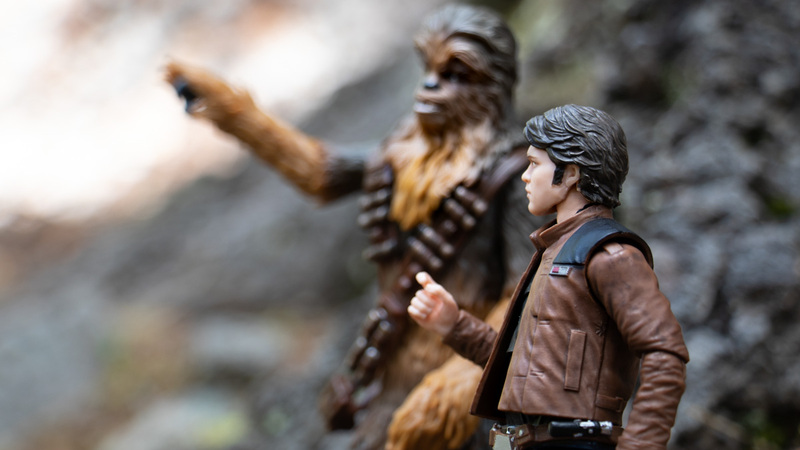 I’m a big fan of the many Star Wars toy photographers who come up with scenes and put characters together in fresh ways. I hope I’ll break free of these self-imposed limitations and take more photos of my collection. It’s funny that I have mental blocks with these characters when I’ve overcome the same blocks with my favorite Star Wars fandom: Star Wars Rebels. The Star Wars Rebels crew of the Ghost grabbed hold of my heart in a special way. That animated TV series told a story that felt more like Star Wars than even some of the recent saga movies. The alien worlds we see, the way a hot-headed young man is mentored by an older Jedi, the piloting skills utilized to escape from Imperial control, a crew that becomes a family… the camaraderie, the humor, the heart. Rebels has it all. It also has a much smaller fanbase, because it’s an animated TV series and fewer people get into those. While the main hashtag #starwarsrebels has over 386 thousand posts, not a lot of them are toy photos. I’ve found a welcoming place in the more intimate hashtag #rememberingrebels (436 posts), where those of us who still mourn the end of the show and seek to keep the memories alive hang out. I’m in good company with a few cosplayers, meme makers, and fan art creators. The benefit of the smaller fanbase is that it’s easier to stand out when there aren’t as many others photographing the subjects you are. Another benefit is that the fans are very passionate, very hungry, and eager for any photos I put out. Sometimes being a Rebels fan feels lonely, because there are fewer of us. But other times it’s a special feeling, that of being part of a tight community. But above all, I have focused on these characters because they’re the ones I care about the most. First and always: follow your passion. If you love taking certain photos or collecting certain figures, do it because you love it and not for any other reason. Who cares how many others are doing the same? Who cares if there are hundreds of thousands of similar photos out there? Your art is your art, and nobody can take that away from you. That said, there are plenty of other factors you can consider when deciding what photos to take. Audience feedback: Which of your photos have people reacted to the most? What generates the most comments or likes? The reactions of your audience can be a clue that you’re onto something special. Ease of production: What environments do you have easy access to for toy photography? Select characters that fit your usual surroundings, and you’ll always have opportunities for more pictures. Your unique contribution: What is missing in the fandom that you enjoy photographing? Is there room for more humor? More scene re-creation? More action? Filling in something slightly different from what others are doing can be a great way to find (or create) your niche. I’d love to hear what niche you’ve found with your own photography, and what you enjoy about it. Drop a comment and let me know! My advice would rather be to try to ignore others’ reaction as much as possible and stay true to yourself. If you do you will always find an audience. Great insight, Maëlick! Thanks for sharing that counterpoint. And “Ease of production” is great advice! I’m often envious of beautiful outdoor photos as well as elaborate studio setups but realistically, I know that’s not for me so I stick with much simpler setups. I always love your Rebels photos. 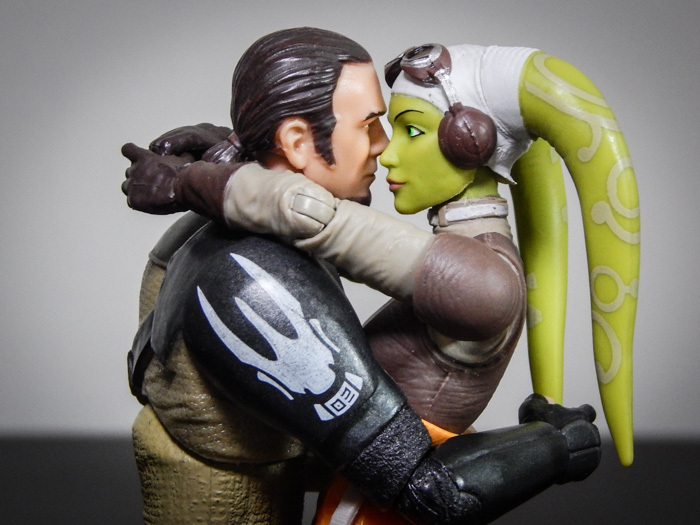 You capture so many wonderful moments between Kanan and Hera. I still miss the show. The new show, Resistance, didn’t inspire me at all….. Thanks for all the kind comments, Lynn. Glad some things in the article were helpful. Yeah, I haven’t had a chance to watch Resistance yet. Probably will, because at least one of my kids is young enough to embrace it, but no idea whether it will resonate for me. So glad there are people out there who enjoy my Rebels pics! Thanks for being one of them! I definitely get the whole trooper thing. I thought I was ready to jump in and shoot some Stormtroopers once I was given a pair, but…they just didn’t do it for me. I like the feel of trooper photos though. That’s why I started getting more Halo figures. Still troopers, but not as overused as Stormies. I really enjoy your Halo shots, Zee. I’ve got a soft spot for that franchise, as my husband and I played it through together early in our marriage. Then we listened to several of the audio books with our kids on road trips in recent years, which deepened the story for us, too. “Your art is your art, and nobody can take that away from you.” That would be my “take away” message from your thoughtful article. Like yourself, I’m a big fan of the Rebels. They have a special spot of my display and I can’t wait to have the Black Series Ezra and Chopper to add to the Ghost crew. Maybe someday Hasbro will make a Loth Wolf or Loth Cat figure – that would be awesome! However, I don’t shoot much of them at all. In terms of my niche in toy photography, I think there’s the consistency in how I try to incorporate positivity in my images, mixed in with a whole bunch of experiments and learnings in this toy photography journey. Lately, I’ve been shooting with the idea of having an end result that I can imagine looking good in print. Like the characters in Rebels, I can totally imagine us all growing creatively individually and collectively in the quest for creative expression in it’s varied beauty. That last line is beautifully expressed, Janan! I love how experimentation and learning is something you consider part of your niche. That’s a great way to always be improving and never stagnating.